Kelly's Korner: Shoes and Church Music! Why is Harper so happy today? I mean she has got the Joy, Joy, Joy down in her heart! Because this weekend we finally broke out shoes!!! I know what you are thinking........just now? She is 8 months old! Well, at first we stayed in all the time and she was so little - shoes seemed uncomfortable so I just kept her in socks. And then she had the great habit of chewing her feet constantly so it was useless to put anything on her feet plus it was hot summer in Arkansas - so we just went barefoot. But since Fall is now officially here - I put her in shoes and she LOVED them. This morning I was worried we might get pulled over by the fashion police for wearing white shoes after labor day (does that rule apply to babies? )........so we headed to Target to get a few new shoes for fall. Really - why are you just now telling me about shoes? What else are you holding out on? 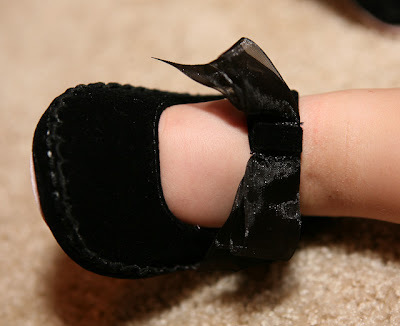 We got these little black sweet shoes that have the cutest bow! and I love these in the fall colors. They are a little big.....but will hopefully be good for a few months! We are growing so fast! Now wait until I tell her about jewelry! Um - remember how we got to meet David Crowder and how we love him dearly???? Remember how I listened to him pretty much on a constant basis all through the hard (and good) times of my life and sometimes when I hear "You are my Joy" I just want to jump up and down because seriously I could just burst because God IS my joy. David Crowder and his band have the greatest songs. Well - his newest CD "Church Music" comes out tomorrow and let me tell you - it is GREAT!!!! And I am just bouncing out of my seat because I have 10 copies to give away!!!!!! So leave me a comment - tell me your favorite DCB song or if you have never heard of him - let me know that - I'd love for someone who doesn't listen to Christian music or has never heard of David Crowder to win this! You have until tomorrow night at 7 p.m. central time to leave me a comment and then I'll list the winners and we will get you the CD's right out so you can start listening!!! Tomorrow - I'm going to come back here and put the link to itunes where you can download the CD yourself and listen to previews of the songs! So come back and go visit!!! Harper says "AHHHHHHHH.......I'm SO excited! I love David Crowder! And you will too!" I'm reading the comments and realizing so many of you have never heard of David Crowder so I'm going to put a few videos on here so you can hear some of my favorites - (I will say that his new CD is good but different than his normal stuff - so you may want to go to itunes and download "illumination" or "remedy" or "collision (so good)" first if you don't have any of his music). I LOVE David Crowder but I'm HORRIBLE at remembering song titles but I do like them! And I Love those brown shoes from Target. I almost got those for Lauren. And I'm digging Harper little clippie. Look how her hair has grown on top :) PS: I'm sooooo going to tag along with Todd next time her overnights in AK! Also - cute shoes, Harper! My daughter, Nora, has those same black shoes from Target. OH HOW He Loves us!!!!! I haven't heard a lot of DCB other than what they play on my local Christian radio station, but I am LOVING the song they've been playing a lot lately - "How He Loves"!!! It just makes me smile every time I hear it because it's SO TRUE! Eyerything Glorious is probably my favorite. I would love to win this CD!! I'm kind of embarrassed to admit this, but I've never heard of him or his music. I would so love to win a copy to see what I'm missing out on. And Harper looks adorable as usual. Never heard anything from DCB but would LOVE to!!! I'm finally finding out I looooove Christian music. I bought a David Crowder CD because I'd seen about him on your blog, but it was all remixes of his songs and I didn't really enjoy it. I'd love to hear what his music really sounds like. Thanks Kelly! Harper's little shoes are SO cute!!! I have actually never heard of David Crowder until I read your post last week that you meant him. I've been listening for him on our local Christian station (95.9 here in LA) and would love to hear more of him! Wait till Harper finds out about handbags! I passed the diease on to my 17 yr. old daughter. She loves them as much as I do. Like shoes ~ you have to have one in every color!! I love, love, love your blog and visit daily. You have the sweetest family and you are such an inspiring christian mother and woman to me. Kelly-Love your blog and love what your message is all about. You and Harper are a joy to read, oh and Scott too. I will probably be the only one who is not familiar with David Crowder. I would love to hear more about him. I have never listened to David Crowder before, but would LOVE to if I win a CD!!! Thanks for doing the give away, I LOVE. LOVE. LOVE praise music and it is my worship time most days. Oh how fun...David Crowder. I cannot remember song titles...I just know I love his music. THose little brown shoes are adorable! I love praise and worship music but have never listened to DCB. I'd love to be in the know!!! I don't think the white shoes apply to babies. Bailey just got her first pair of tennis shoes last week and they make her look so grown! My sweet girl was dx with RSV today. I'm so upset so come to think of it some new praise and worship music might be just what the doc ordered! Oh, I LOVE David Crowder Band! My favorite song is "Come Thou Fount" and I can't wait to hear his new release!! Pick me, please!! My favorites are Never Let Go and Oh Praise Him!!!! You got those shoes from Target???? I need to check it out!!! They are adorable! I have never heard of him, but would love to begin after hearing such a high recommendation from you. Even if I don't win, I will try to download his music. Thanks! So excited! My favorite is Never Let Go!! We love everyone of his songs...haven't heard one I didn't like!!! Love the shoes...Lucy LOVES shoes herself!!!! She changes about 14 times a day!! We love music at our house but I don't think I have ever heard David Crowder or if I have I didn't know it. I would love to win one of his CDs! LOVE David Crowder Band! He has recently recorded "Oh How He Loves Us." So good! I am a huge fan of DCB! I love pretty much all of his songs, but "How He Loves Us" (I guess that's the title!) just does something extra for my spirit. I have never heard of David Crowder and would LOVE to hear his music! I have seen David Crowder in concert but it was so many years ago. I would love to hear him again. Sometimes music just hits the right spot when you hear it! I have never even heard of David Crowder until I found your blog. I am loving the shoes! I would love to have a copy, never heard of him until you mentioned him here. Oh and good game Saturday but my Dawgs pulled one out. At least Harper was THE cutest baby in Hogs gear! I HEART David Crowder Band!!!!! I have only heard of David Crowder on your blog! HA! I would love to win a copy of the DCB CD! So, choose me, choose me!! Harper is so adorable in her fall outfit and shoes. I love the face she is making in that last picture, so cute! I've read on your blog several times how much you love David Crowder, butI'm embarassed to admit that I've never listened to him. I'd love to win the CD! I LOVE DCB!!! I always listen to him on itunes when I clean house...makes it less painful! "Everything Glorious" and "Glory of It All" are my two favorites! But really I love them all! I would love a DCB, but I can't remember their titles. I have actually never heard of DCB but I am very intrigued and will go hunt a link to listen to them now. I have not listened too much christian music but the few songs I have heard I liked very much. Your shoe story cracked me up. You are so down to earth and I love it. My favorite DCB song, is No One Like You. My family and church youth have attended a World Changers project now for 4 years (in Little Rock this past summer). I was introduced to DCB through WC, and this is the song they played the first time. I love it.....It is so true. How can He be so good to me? Never heard anything before from David Crowder...but would love too!!! I would really love a CD. I have actually never listened to them, but I do LOVE Christian music so much! I would love a CD!!! Honestly, I've seen you and other people say such great things about him, but have never heard any of his music! I know I'll love his music! I have never heard of them before. I would love to hear their songs. I too went through infertility treatments and am going through the ttc process again. I had many songs that helped me get through the times, and would love to hear of some more. We didn't get my son shoes until he was 11 months old! Our daughter on the other hand had about 5 pairs before she was even born! :) She is almost 2 and when she sees shoes in the store she rips hers off and screams to get more! Oh the life of girls! I have heard of David Crowder Band - mainly from looking at blogs I think! I don't own any of their music. I actually have never heard his music either but would like to give it a try. I've never heard David Crowder (that I know of) I may have and just not know it was him. Can't wait to hear his music. All that I can say!!!! That is soooo my favorite and I didn't even know any of his songs until I started reading Angie's blog. I was super exited that you met him in person. Would love one of those CD's to listen to! I love "O Praise HIm" because it was the first CD of his that I listened to. It was my happy place to get in my car after high school and hear that play! I went to Baylor and ran into him at Target once, but I didn't have the guts to say hi! So glad you got to meet him!! Well Kelly, I dont have good luck at winning things but I am going to give this a shot. I have never heard of David Crowder, but would love to have a copy of the CD to listen to and share with my girls. Cant wait to check back tomorrow to see if I won. I love the little black shoes! Target ALWAYS has the cutest shoes! LOVE David Crowder! I have to say I think Stars is my recent favorite. Oh and totally LOVe those baby shoes... gotta be in style! The shoes are adorable. I have never heard David Crowder but I'd love to! I would love to have one of the CDs. My favorite David Crowder song is Here is Our King. His music just lifts me up all the time! Can't wait for the new CD! Love music of all kinds. I have been listening to Casting Crowns a lot lately. I don't think I have heard DCB, but I might recognize a song if I heard it. I would love to win a CD! Kelly, I had never heard of David Crowder until you mentioned him on your blog earlier. I would LOVE to hear his new music and get to know what everyone loves so much about him! I had never heard of him until I read about him on your blog. I still haven't heard his music though. Even if I don't win I will make it a point to find the song you mentioned and listen to it! And Harper's shoes are ADORABLE!! Love David Crowder! Can't wait to hear his new CD! I love "Open Skies" !! Love Harper's little shoes. I mostly just listen to the Chrisitian radio station, instead of CD's really, so I'm not up on specific songs, but I know I have always liked anything DCB. Sounds like it'll be a great CD from the title! I have to be honest and say that I have never heard of him before! I am new to Christian music and would love to win a copy of his CD! You definitely inspire me in so many ways! I love reading your blog! I <3 David Crowder Band! They were one of the first Christian groups that I listened to. I think my favorite song is "Oh Praise Him". Thanks for sharing with us! Although I have never heard of David Crowder, I would love to win! Well, I am happy to say that I bought my first David Crowder CD this weekend, and I love it! We sing "Everything Glorious" at church all the time. I have no idea why it took me this long to buy it, but I would love to win his new one! ...I could go on and on, but these are a few of my faves that we sing...more like rock out to...in children's church. I love "Everything Glorious"! We used to sing that at youth group in high school! Thank You For Hearing Me is my favorite DCB song. I LOVE it! I love oh praise him,but there are a lot to choose from. undignified and everything glorious are two of my favorites. i got to see them this summer at a summer concert festival at kings dominion in virginia, and honestly, DCB is the reason i went! love them and their music--and would love to win the cd! you and angie are going to hook us up this week! Would make my day to win a cd. Love Harper's shoe pics! I have just recently found David Crowder, thanks to you, Kelly! I am loving his new song "Shadows." I am so glad that you turned me on to him because I'm loving going back and catching up on what I've been missing for years apparently! THANKS KELLY!!!!!!!! I've never heard of him until your blog, but I am sure I would love his music! Love looking at all your pictures!! i LOVE dcb. i have seen him in concert ONCE at a youth leadership conference with all of our youth group leaders and we were worse than the youth kids would have been how excited we got over seeing him live. i couldn't possibly pick a favorite song, i love them all! This is my 1st time leaving a comment on your blog. I read it almost daily. Harper is a baby doll! The shoes were super cute! You need to try Kid Express Molly's, when she starts walking. They are cute and seem comfortable too. By the way, I would LOVE to win the David Crowder CD - I have never heard him. I graduated from Baylor -- isn't he in the Waco area nowadays? Anyway, heard of him, but don't know his songs. Looks like Target was a hit. SHe is precious. I have heard of David Crowder Band but never listen to his music. I would love to hear him. I listen to other praise and worship music. Harper is so adorable. It would be a toss up between "Oh Praise Him" and "All Creatures". All I can Say is so amazing, love it love it love it. I would love to win too! Love Love Love Harper's shoes and I can tell that she loves them to. I"ve just recently heard of David Crowder. Everyone is so enthusiastic about him, I'd love to win the CD! Thanks for the chance. haven't heard any of their music, and i could probably use some listening to it....need to turn myself back towards Him. your blog is always so inspiring and ooh soo cute! I would love to win this CD! I love many of his songs...I just don't know the titles to them!!! Can't wait until you reveal the winners!!!! Hi Kelly! I'm a college student in NC and I LOVE your blog. I read every day and just think you and I would be such friends in real life...and how I would love to be your babysitter if we lived closer! I'm getting married in June and my fiance and I LOVE DCB. We go to Passion each year and we are both so jealous of your encounter with him in real life! That must have been so awesome! Anyway, our favorite song is "The Glory of it All." It's the first song my fiance ever played to me on the guitar over three years ago when we started dating. We sang together and continue to love his worship music. We are in a long distance relationship and so I would love to mail him the CD as a surprise. Thank you for being such a beautiful inspiration to us girls! DCB is so awesome and so, so inspirational. My all time favorite song is "Oh Praise Him" but I have about 10 more favorites too!! I'd love their new CD, I can't wait to hear it! I don't think I know David Crowder. But my interest is peaked! I've never heard a David Crowder song! Would love to win a fab CD. First of all, Harper has the SWEETEST faces! And I just LOVE her cute new shoes. My daughter just started wearing shoes a few months ago (and she's 14 months already), because she didn't really like them and spent most of her days crawling around anyways. Now, I wish I had more shoe choices, so I'll be looking at the sales soon. Secondly, I would LOVE to have a David Crowder CD. I honestly don't know which songs are his, but I'm sure I've heard them on the radio. I'd love to win my first of his CD's. My daughter LOVES to watch PraiseBaby and I'm trying to make it a habit of listening to praise music as background during the day. I too have heard the name, (I am sure it was from your blog) but I couldn't name one of his songs. I am sure I have heard them but couldn't place them to the artist. Thanks for the photos & stories, your daughter is gorgeous! My wife is in desperate need of a new CD, this would be a wonderful addition to her rather depleted selection. I had never heard of him until you blogged about meeting him. Harper is so beautiful and I love all her new shoes! Stop by my blog to enter my 100th post giveaway. Have a good day. I have heard of the David Crowder Band, but I have never heard any of his music. I would love to win. We are a praise kind of family, so anything that brings praise to God is played in our house. I love David Crowder and his music. I have several CD's and I think my favorite is Illuminate. I would love having his new CD. Harpers new shoes are darling. She seems pleased. I'm sorry to say that I have never heard of DCB. Until you mentioned him on your blog...of course. I'd love to listen though! Oh I love little Miss Harper in shoes but miss her "big bow", Glad her little foot is doing so good to be able to weaar shoes, I have only listen to David Crowder by way of youtube from your blog, but I do love Christian music and my car rocks when I am driving alone, listen at home also but LOUD in the car. How cute are Harper's new fall shoes? I'm excited about the new DCB CD being released -- my favorite song is "Everything Glorious". Many thanks! I love Christian music, but have to say I don't know this band. Would love the new CD to join in on the joy of his music! I LOVE DCB! My favorite song is "Never Let GO." It would be a great companion to my new Selah CD ;) Hehehe! not a regular listener of the DCB, but I would love to be! thanks for the opportunity to maybe win!! I have never heard them before. I can't pick just one! I love O Praise Him, Everything Glorious, Here is our King, and You Never Let Go. Thanks for the giveaway!! First of all, those shoes are adorable!!! I'm not sure of a DCB song...I listen to Air 1 but I never pay attention to who sings what songs...I'd love to win the CD though! I'm sure I'll love him too! What an awesome giveaway -- thank you Kelly, and DCB! I love DCB, and while I love every song that I've heard, I have a special place in my heart for his older songs. My husband and I were volunteer youth leaders when we lived in Baltimore. Our daughter had just been born, and the 3 of us took a trip with the youth to a MD youth gathering where DCB was playing. "O Praise Him" is one of my fave songs, not just because it's a great song, but because it reminds me of the wonderful youth we worked with in 2004-2005. My fave is "Open Skies"!!! My husband likes him too, even though he says that if my "like" for DC gets any worse, there'll be issues :) All in joking and fun! We listened to all the CD's on our way to Wisconsin (a 12 hour drive) and back after the aforementioned friend's wedding. I just LOVE the music!!! I haven't ever listened to David Crowder, but my husband LOVES him and knew exactly where you were when I showed him the blog ("oh, they're probably in Waco, he lives there" ...what?) So I'm sure he'd be thrilled if I won a copy so he could introduce me to a new band (slash POSSIBLY steal the CD for a few car rides to and from school). Hubby and I walked out to "Oh Praise Him" at our wedding. Love that song. Also love "We are Here" and the whole Beautiful Collision cd. You're great, Kelly. Its exciting what the Lord is doing with your blog. Isn't it amazing how He does so much more than we could ever ask or imagine? Cute shoes too! Harper is so adorable! I guess this means her little foot is healing well from the surgery? Awesome. We are huge Crowder fans and Louie Giglio for that matter too. They both are on campus at Baylor for the new DCB release tomorrow. Oh, how I would love to be back there~sic 'em bears! I can't pick just one fave....I love them all! I love David Crowder! my kids found out about him at Bible camp last summer, and I love Undignified! Beautiful song! This CD would make a perfect Christmas gift for my 16 year old, so if I don't win, I will buy it for Christmas! i love all of his music!!! I LOVE DCB! I'm 16 (almost 17) and after loving on my two little foster sisters for 11 months, I just had to say goodbye to them. I miss them more than words can express, and it has been SO hard. David Crowder's music has been such a comfort and blessing to me during this time. (I listen on youtube because I don't have his music!) I love all his stuff, but I especially love his version of "all creatures of our God and king" and "come thou fount". I would love the c.d!! LOVE all the shoes!! Adorable!! I must be really isolated in the desert here because first I hadn't heard of Okra, then I hadn't heard of the Hogs, NOW is the first time I"m hearing of David Crowder. In fact, I just asked my husband if he heard of David Chowder... so nope.. never heard of him. I think I need a CD so that I can bring some culture into this house! Plus, Owen would probably love it too! My daughter, Kenlee, had both of those pair! I can't sell them on Ebay, because they are SOOO cute. I love the black one's. I wish they made them in a 6 or 7. I am going to listen to the song you mentioned. I've never heard of him until I read your blog. I am seriously out of date with christian music. I had to ask a teenager who Hillsong was. I do however know David Crowder and I do love his music. I don't know titles but I have a few of his older tunes that i listen to a lot. Winning a new CD would be perfect for me. I just can't afford to buy CD's these days and the radio is boring playing the same songs everyday. I hope I can replace an old CD for a new one! 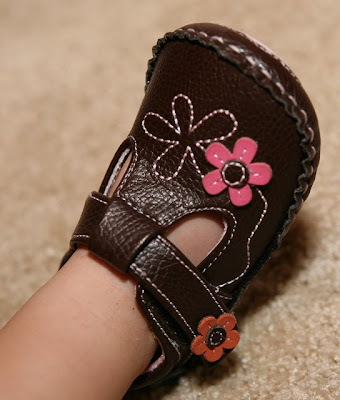 Gotta love "All I can say"
Harper's shoes are ADORABLE! I have a Harper too (she's almost 4 months) and her feet are still too little for shoes, but we have so many cute pairs for her to wear when she grows a bit more! I have never listened to him, but would love a CD! And Harper's shoes are adorable! Love the last CD, but the new song Oh How He Loves Us Oh, How He Loves Us, Oh....makes me teary everytime I hear it. I can't tell you how much you inspire me and give me hope to continue to wait for the blessing God will grant us! I have never heard of him, but would love to play some inspiring Christian music in my home. I just started listening to Christian music about a year ago so I don't have a fave DC song yet - but I'd love to win!!! Thanks for the chance. Love Oh praise him!!! and love harpers accesories! shes too cute!!! I love all types of music but have never heard of David Crowder! I'd love to own his new CD. Also, I love Harper in her new shoes. She looks great in everything you put on her. I've only recently discovered the awesomeness that is DCB and don't have any of their albums...yet! Hi, Kelly ~ My favorite is "No One Like You." Christian music got me through my cancer and it is how I pray while stuck in rush hour traffic daily. Your comments about DCB made me investigate him on You Tube and you are right he is fantastic. Hmm...I honestly don't think I have a favorite DCB song. I really love them all. I really like "The Glory of it All". Such a great song about the Gospel! Grace has those little white sandals!! Well, not for much longer because her little feetsies are about to hang over! But anyways...love the fall ones too! I don't know any David Crowder Band songs by heart but I do love their music!!! Love the last picture of Harper...that face is priceless! Talk about precious shoes! I recently started to listen to Christian music and I'm falling in love! Never listened to David Crowder! Maybe I will tonight! You are the one person who brought be back to God so if you listen to this I just may have to listen to them! I don't listen to much Christian music - and hadn't heard of DCB until you and Angie mentioned him. I'd LOVE to hear it, though! I have never heard of him till your post! Would love to win his CD!! Don't you just love Target?!? Those shoes are too cute. David Crowder is awesome! I don't really have a favorite. I love them all! I've not listened to DBC all that much, but do like the song "All I Can Say". I have never listened to David Crowder, but I would love too! I love the new shoes!!! I'm a big "shoe" fan. I listen to my local christian radio station, but I don't remember titles to songs, just the parts I like to sing along. Would love to win the CD!!! I would have loved to have been there when you met him. I bet you were SOOOOO excited!! My favorite song is Never Let Go. I have a favorite DCB song but at the moment I can't remember the name-O phoo!! Love the new shoes Harper. They are gorgeous. I have never listened to David Crowder, but would love to win a copy. I have never heard of DCB until your blog. I saw a video on Youtube with their song, "Oh Praise Him" with a young man walking the streets & singing the song. Beautiful. Love Harper's new shoes! The brown ones are my favorite... so cute! Oh Praise Him! I LOVE DCB!!! FUN! I have heard of "David Crowder" from Angie Smith's blog...I think you're both in love with the same man! ha. I'm kidding. I've never heard his music, but I'm sure he's great since he has such great fans. And those black shoes are just too much! Love 'em. Harper is a doll as always! I had not heard of DCB before your blog, but I'd love to win the cd! I'll be honest, I've heard of DCB, but never actually heard any of his songs. And since we do not have a Christian radio station around here I would love to win a CD! i was so embarrassed b/c i didnt know any names to DCB songs, so i looked it up and realized that I DO!!!! I just listen to my christian radio station non stop and never know WHO it is singing the incredible songs! so my fave is definitely HOW HE LOVES US! and i would love to win this CD! Never Let Go by DCB !! just had a baby girl and cant wait to buy shoes for her!! I just searched my itunes and I have one song by DCB 'undignified' I love it. I would love to hear more of his music! I know I must have heard it but I don't own any... yet! Thanks for offering such a generous giveaway! I have never heard David Crowder before but I have heard that he is great. I love DCB and my husband loves to play them. I love "Come and Listen" and I even have some of the lyrics from it on a picture in our dining room. I am a Christian but have never heard of David Crowder... I would love to hear his music... Pick Me! I just heard of David Crowder from your blog but would love to win a CD! I love all of Harper's new shoes. Makes me want to go shopping :) Never heard his music, but I'm always up for good Christian music! 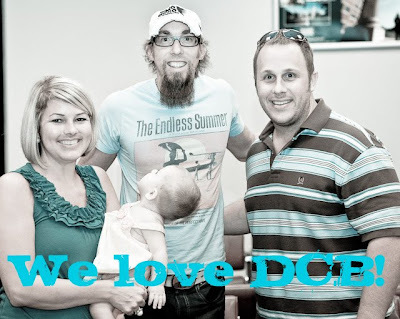 We love DCB here too! My hubby and I first were introduced when they opened for Third Day a few years ago and have all their CDs! We just learned his new on OH HOW HE LOVES US in church this past week! It was amazing!! I only have heard of David Crowder through Angie's blog and I love the songs she has featured. I remember she said it was hard to find his CDs so I would love to learn more about his music!! I am new to Christian music...I didn't think I would like it until I heard his voice! Would just love to have his cd! My all time favorite is All that I can say!! Harper looks so precious in her shoes! Love DCB - my 6 year-old is always singing "Never Let Go"
"All I Can Say" is my favorite! I love "all I can say"!!!! The best song ever!! Love Haper's new shoes!!! DCB ROCKS! I love his songs. I love "Come thou fount". 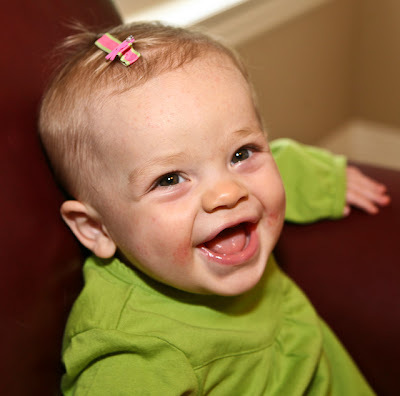 I am new to reading your blog, but love hearing all the updates about Harper. I just recently had my first child, and feel like you do. I just love her so much and could talk about her 24/7 if someone would listen. I am trying so hard to work on my faith. My brother passed away suddenly a few years ago and ever since then I have been struggling with my faith. I just got the daily inspirations book by Joel Olsteen and LOVE it and it starts my day out in such a positive happy note. Now if I could win that cd I could start my day out great and listen to soulful music on my way to work. I would love to win. I have heard of DCB, but I don't know the names of the songs. When listening to the radio I'll hear a song I really like then learn that it is the DCB. I need to start remembering the names of the songs better! I've heard of David Crowder lots b/c of our local christian radio station but am not familiar with their music. You can't have too many CD's! Thanks,Kelly!!!! I've never listened to his music, but would definitely like to! I have heard of David Crowder from your blog, and I listened to him last week on a Christian radio program. But I really don't know any of his songs, so I would love, love, love to win a CD so that I, too, could love him as much as you do!! Love David Crowder. He's coming to our church in February? I believe. Can't wait to see him in concert! My favorite DCB song is probably "No One Like You" It's great to run or clean to. I also like "All Creatures of our God and King" Thanks for the giveaway! Love harper's new black shoes! They are adorable! Love the shoes...so ready for Fall!!! Love those little black shoes! Oh little girl things are so fun! I love David Crowder, but I would be entirely too chicken to say anything to him if I saw him in public! Favorite song...that's a hard one, probably Foreverandever. I love the DCB and I listen to KLRC here in Rogers all the time. I love their new song "Oh how He loves us." I love DCB because they are so uplifting and speak to my heart in many ways. One of my favorite songs is All I Can Say. I just downloaded it from itunes last week. Thanks for doing this I hope I win. Oh Praise Him is my favorite DCB song (for now!) Thanks for doing this giveaway! I love DCB, love your blog and would love to WIN! I've never won a giveaway before! I would love to win his new cd. 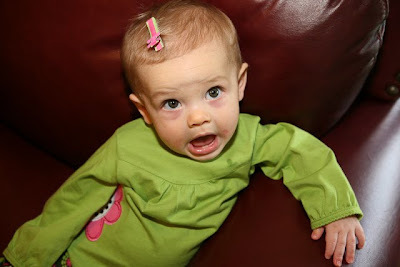 My daughter loves praise music but we have never listened to him. I am just slightly familiar with DCB. My boys like to listen to music and it would be so awesome for them to have some Christian music to add to their ipods. Harper's shoes are precious. I am a fan of shoes, jewelry and purses. A friend of mine said that "they always fit" and she is so right!